The start of the school year was right around the corner when an enormous stationary storm dumped record amounts of rain over the state. Massive flooding meant ruined classrooms and buildings. With no hope of clean up before school began, the school district board sought a rapid response solution. The school district knew only an experienced partner could pull off of a project of this nature, so they called Mahaffey. 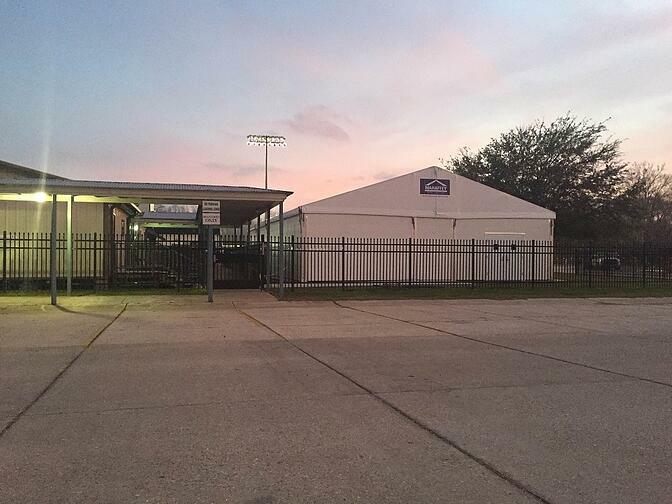 A Mahaffey Super Series Clearspan structure became head of the class for this project. Mahaffey was hired by the school district based on the client’s knowledge of our industry expertise in disaster recovery and rapid response work with other schools. Our team had recently constructed similar temporary structures, including gymnasiums and cafeterias throughout the southeast. The scope of this project included five temporary school band room structures for four school locations. The structures had to be large and sturdy enough to comfortably fit student musicians, instruments and teachers for at least a year. Mahaffey managed logistics for the delivery and set up the structures, accommodating adverse soil conditions caused by flooding and adhering to several regulation sets, including: fire egress, ADA regulations, FEMA temporary structure guidelines and the construction of drain tiles to divert water from the structures. The structures were required to have smoke detectors connected to the school alarm system. Additionally, the schools had limited electrical voltage. As a disaster recovery project, the timeline to completion was short. Because our team possesses years of experience, all the necessary operator certifications, a vast inventory of structures and equipment in our warehouse, and the ability to deploy immediately, we were quite literally well-equipped to meet the client’s needs. Our crew managed the logistics and installation of the Super Series structures at all four locations. The structures featured insulated hard-side panels and fabric tops. We also securely raised the AC unit racks five feet off the ground. Structure amenities included flooring and100-watt LED lights. Our team even provided lower voltage AC units to accommodate the schools’ limited electrical supply. Most importantly, we had the job finished on all four sites in six days! Our final design included five-Super Series Clearspan tent structures featuring fabric tops and insulated hard panel walls. The entire structure measured 40’ x 66’. The result for the school district project was excellent. The client had a temporary school including the band rooms provided by Mahaffey for the school year within the timeline requested. Mahaffey maintains an ongoing relationship with the schools where the structures are still being used as the school district continues repairing and rebuilding. Not every disaster comes with warning. This particular disaster the Washington Post dubbed the “no-name storm” actually dumped 3 times as much rain on Louisiana as Hurricane Katrina. 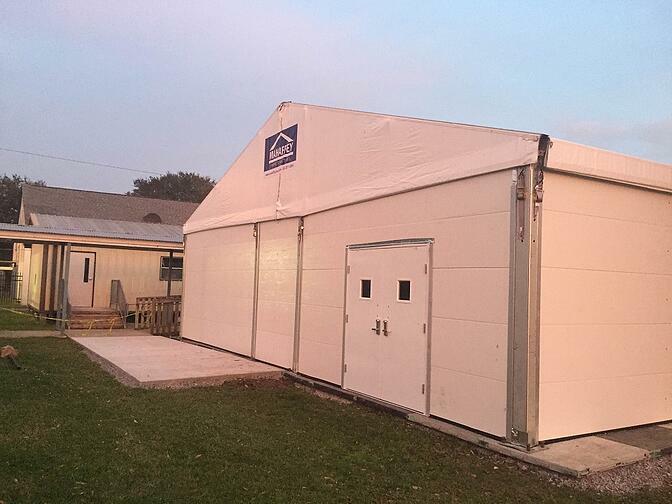 Temporary structures offer rapid response solutions for needs of all shapes and sizes. When turnaround times matter, an experienced partner with all the necessary certifications, training, and on-site equipment can guarantee your project is complete by the time the bell rings.